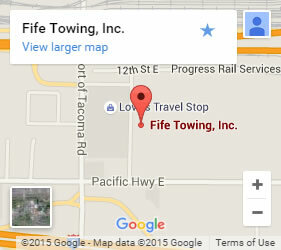 Fife Service & Towing understands that your truck is your livelihood. When business is interrupted due to a breakdown, load-shift, flat tire, or other roadside emergency, it is imperative that the problem be resolved quickly. Time is money when it comes to semi-truck towing, and Fife has everything needed to solve any concern. We offer services 24-7 for roadside assistance and towing. Call now and get fast, experienced solutions in Lakewood and the surrounding areas! Whenever possible, our priority is always to get you back up and running. If you have run out of gas, are stuck in mud or water, have been locked out, or any other combination of issues that stops a semi, our knowledgeable technicians have the expertise and equipment to take care of the problem. We have been a locally-owned, multi-generation company since 1949. We have the dedicated experience to handle any situation. Our large fleet allows us to be ready to assist, 365 days a year, 24-hours a day. Tell our dispatch what you need and we show up fully prepared. 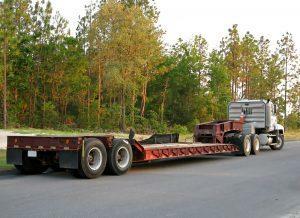 We have crane vehicles, flat beds, and more. We can even safely store your cargo if you need a mechanic to repair your tractor truck. Whether your RV or SUV is stuck or your heavy-duty commercial truck is on the side of the road, our team of certified towing technicians has the equipment and the knowledge to help. Call today for any type of tow. We’re here and we’re prepared!